reading | Oh, for the HOOK of a BOOK! Merry Christmas and Joyous Season to Everyone: What Books Did You Get? Merry Christmas and Happy Holidays (which includes if you are having a holiday such as a vacation)! I hope you have been enjoying the magic and love of the season, no matter what you have going on in your life, how you celebrate, or if you have to work. Whatever you case is in life at the moment, I hope you have had or get to enjoy some time to relax. It’s the small moments that count and the memories that last. I’ve been spending a lot of time with my kids while they are on break from school. We had a wonderful Christmas and we are enjoying our holiday time connecting with each other. To me, this is the most important thing in my life, so I’ve not blogged, put most work and writing aside, and limited my time to them. It’s why my holiday message to you, readers and friends, is somewhat delayed! I’ve been busy baking, reading, cuddling, making bracelets, coloring with Sharpies, and playing with Monster High dolls. I do wish all of you much joy, happiness, and love during the hustle and bustle of this end of the year time. I hope you are taking precious moments to enjoy your kids or grandkids, give to those less fortunate, count your blessings and think on your positives. I hope you embrace the feelings that come from having a heart two sizes too big. We have some special traditions that I look forward to every year. 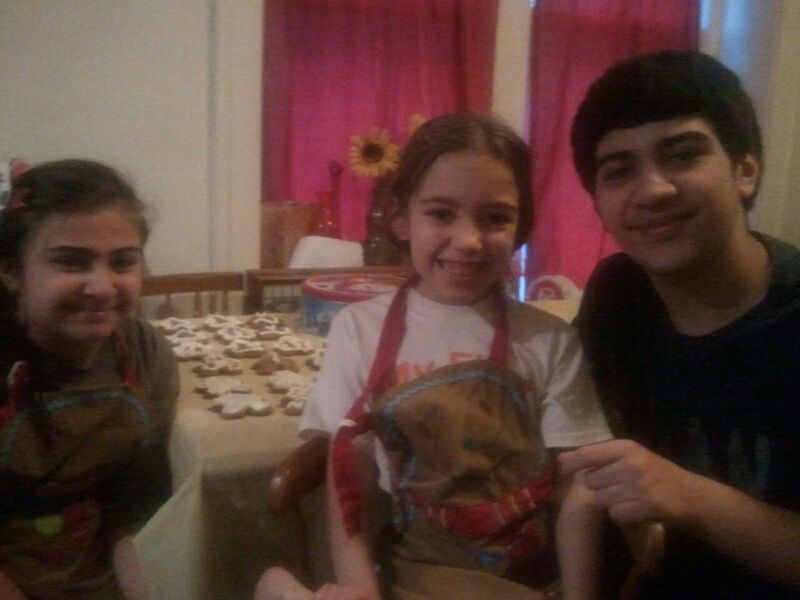 The kids and I have been busy baking sugar cookies and gingerbread cookies. The latter we make from my great-grandma Emma Bryan’s recipe, which is hundreds of years old. We talked about our ancestors and connected to our past as we rolled the dough. We talked of our past and of our futures together. We made wonderful memories. We recorded our cooking baking process on Instagram (Erin Al-Mehairi) and Twitter (@ErinAlMehairi). The pictures are really cute if you want to check them out. We also have watched our Christmas favorites on Netflix and on DVD, such as The Muppet Christmas Carol, Rise of the Guardians, Peanuts All I Want for Christmas is a Dog to name a few, and some other movies for fun as well. We made homemade hot chocolate that simmered all day and then drank it while we watched The Polar Express. We’ve cooked together our favorite foods, decorated our tree and remembered each memory from almost each ornament we pulled out, and read books such as The Grinch Who Stole Christmas (Nassem read to his sisters and me in his best Grinch voice), The Nutcracker, and Madeline’s Christmas. We read of the birth of Jesus and set-up our Nativity scenes under the tree. And not to be forgotten, we are excited each year to write letters to Santa and put them in the red Macy’s mailbox under the BELIEVE meter, pick out a Yes, Virginia ornament to hang on the tree, then hang our past Virginia ornaments while watching the Yes, Virginia animated story. Happily, Netflix streams this favorite version. Next year, I think I’ll splurge for the picture book. We’ve had a great time carving out special minutes together. I know when they are older this will be what they will remember, not any high-priced gift that quits working or goes obsolete in a year. Listening to the Nutcracker Ballet while hanging ornaments and eating homemade cookies will be what they tell their own kids that they did each Christmas. I hope they even pass down our traditions to their families. 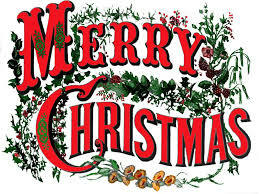 I hope that you are having a wonderful holiday as well. What are your Christmas traditions? Have you made time for reading like us? Did you get any good books for Christmas? Feel free to leave your comments below! I’d love to hear. In the meantime, I’ll be reading and working on catching up on all the Fall reviews I owe (I really own a huge backlog), some great new ones for January, and some super interviews I have coming up! Love to you and yours! And I’ll be back with more posts soon! Baking and Frosting Gingerbread People! Does Hook of a Book Sound a Little Seuss-y? Happy birthday Dr. Seuss! It’s March 2 and not only is it National Read Across America day but is also the 107th birthday of the late Theodore Geisel, more lovingly addressed and remembered as Dr. Seuss. I remember as a child waiting for the mail to come every month and getting a new Dr. Seuss classic. My mom had signed me up for some mail order subscription and I was estatic to get them. Today, my kids are still enjoying my hand me down Dr. Seuss books of Green Eggs and Ham, The Cat in the Hat, The Foot Book and many more, but also the new titles featuring the Cat in the Hat teaching numerous non-fiction subjects such as maps, birds, oceans, and even cooking (at least he has amazing clean-up techniques!). Today I caught a bad case of the flu or a cold. I’ve been feeling terrible and was afraid I’d miss our plans of going to our local library’s “Seussabration” after school. I did miss it unfortunately, but the kids did go. My son helped the two girls to make Fox puppets out of lunch bags, Seuss posters, and they listened to Mr. Brown Can Moo Can You? read by the local librarians. Some school classes had parties today with birthday cake and hats as well as many libraries having events. Whatever your children did to celebrate, remember that the most important thing is to encourage reading in your children every day. 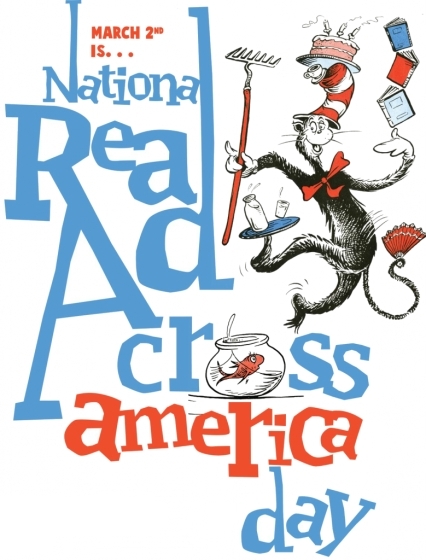 What can you do to commemorate National Read Across America day? *Make your child a book nook where they can retreat to read books daily. *Schedule time to read a book to your child at least several times a week. *Make special bookmarks they can use in their book nook. *Have your child draw a photo of what a story was about after you read it. *Ask questions and talk about what you read. *Have a party and invite your children’s friends over to read books and make tote bags for their trips to the library. *Buy your child a new book for March, to celebrate reading. *Take a trip to the library to participate in story time or crafts. Purchasing your child books, reading to them, and encouraging them to use the library is a lasting gift! Leave your children with a legacy of reading, just like Dr. Seuss has left us with a legacy of silly, funny, awesome, unforgettable books. Great post from Tim Busbey (www.timbusbey.wordpress.com) about fiction writing in response to a recent writing by Brad Meltzer. Reality bites – fiction rules! I’m taking the 2011 Stephen King Challenge, You? It’s a new year and time for goals!! Though I generally do read a lot of Stephen King, I am going to take this challenge offered by Book Chick City. You can see more information here: http://www.bookchickcity.com/2010/12/sign-up-2011-stephen-king-challenge.html. You have to read 6 to 12 books by him in 2011 and I’m sure 6 is what I’ll do just for the mere fact that many of his books are sooo long. I read Under the Dome last year and that was a huge book with over 1,000 pages! I have a few new ones to read, like his newly published short story compilation called Full Dark, No Stars, but I have some I may re-read that I read in my early years also such as Dead Zone. I’m supposed to put the button and link to the Stephen King Challenge (scary little IT clown picture…yikes!) on my sidebar, you can either go above to the link I provided to learn how to sign-up or click on the sidebar button. You can look for my reviews here on my new book blog! My favorite Stephen King book is one from more recent years, Duma Key, that I read last year. I LOVE how he made the art really come to life in such a gripping way. I also really like Rose Madder, which hit home with me when a woman runs away from her abusive cop husband and starts a new life. However, a painting she buys lures her in to another world. Again, art taking life. What is your favorite Stephen King book? In the meantime, while I am reading, be sure to also check out my other blog at www.breathebeautyartandphotography.wordpress.com, if you like photography, art, doing things with your kids, baking, and musing on life.